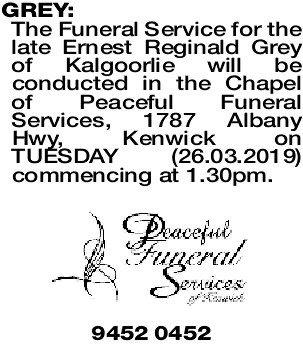 The Funeral Service for the late Ernest Reginald Grey of Kalgoorlie will be conducted in the Chapel of Peaceful Funeral Services, 1787 Albany Hwy, Kenwick on TUESDAY (26.03.2019) commencing at 1.30pm. 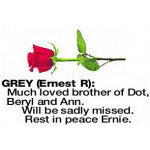 Much loved brother of Dot, Beryl and Ann. 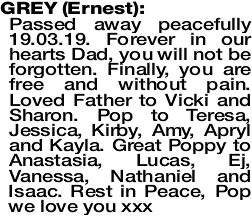 Will be sadly missed. 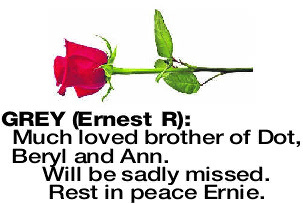 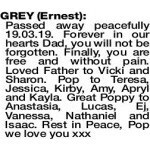 Rest in peace Ernie.